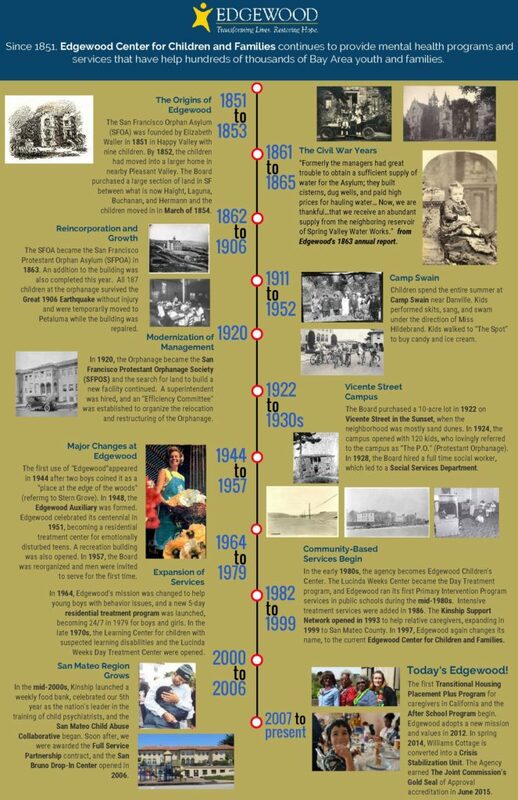 Edgewood’s proud history of working with youth and families extends back to our founding in 1851. For over 16 decades, Edgewood Center for Children and Families has been supporting youth and families in our community with a wide range of services, making us the oldest children’s charity in the western United States. We offer over 27 programs in San Francisco and San Mateo counties. Our programs address behavioral and mental health challenges. We use prevention and early interventions, community-based treatment, intensive programs, and residential care to support and improve the lives of young people in our community. Our belief in and dedication to every child we serve guides our work. Our values of engaging families, developing community, generating hope, and embracing diversity ensure our success.